What should have been celebrated as a great night of exciting world class kickboxing at Enfusion Live 49, was overshadowed by a couple of shocking incidents, following both Mohammed Jaraya‘s defeat to Redouan Laarkoubi and Tayfun Ozcan knockout win over Nordin Ben Moh. Jaraya was on the wrong end of a decision loss to Laarkoubi after an extra round in what was a thrilling encounter between the two kickboxers. In the aftermath of what was one of the most exciting fights so far this year, chaos descended when shortly after the bout was awarded to his opponent, Jaraya would proceed to leave the ring and attack one of the judges seated at ringside. What happens next will be interesting to see, especially the kind of example that both Enfusion and the sanctioning body of officials, Federatie Oosterse Gevechtssporten (FOG), will show the world by, disciplining Jaraya for his shocking and inexplicable behavior outside of the ring. The pictures of Jaraya assaulting the judge clearly show the young fighter striking the judge on the right side of his face which, sent the judge’s glasses flying off his face, from the impact. Sources close to the scene last night stated that the victim was in fact, the chief judge in attendance at Enfusion Live 49 and that the officials were in a state of shock at what had happened and couldn’t make sense of it at the time either. For such a highly talented and world class fighter to lose his temper after losing a close fight is a real shame and no doubt, the consequences will be something that Jaraya is going to have to live in years to come. 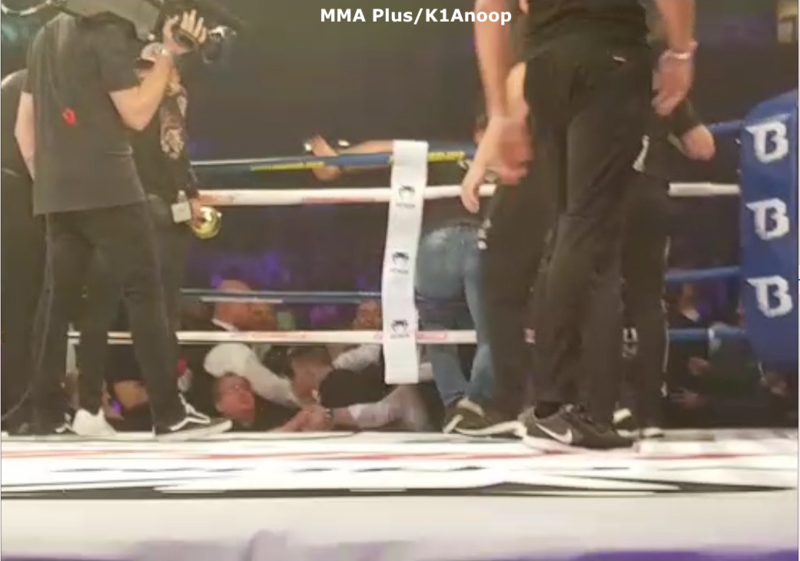 Immediately after Ozcan emphatically knocked out Ben Moh, numerous people invaded the ring whilst Ben Moh lay on the canvas unconscious and needing urgent attention. With GLORY Kickboxing returning to the Netherlands on May 20, 2017 for GLORY 41 Den Bosch, headlined by, Enfusion heavyweight, Ismael Lazaar vs. Rico Verhoeven, could this and other future kickboxing events be placed at risk of even happening if the Dutch authorities react very negatively in the aftermath of Enfusion Live 49? For the sake of not only Dutch but world kickboxing, we certainly hope not but only time will tell as to how much the sport will be tarnished by Jaraya attacking the FOG official. Tayfun Ozcan fought as if his life depended on it against Nordin Ben Moh and produced an unstoppable performance to powerfully KO Ben Moh who, had been leading the 72kg Enfusion League until last night’s defeat. With one last round of fights remaining in the ‘League’, Ozcan now has a two point advantage over Ben Moh and returns to first place and as the favorite. Both the Ozcan vs. Ben Mo and Jaraya vs. Larkoubi fights made brilliant viewing and despite the date clash with GLORY 40 Copenhagen (running at the same time), delivered a very entertaining night of kickboxing. On a more positive note, Ibrahim El Boustati successfully defended his middleweight title by decision against “It’s Showtime” and GLORY veteran, Filip Verlinden. El Boustati was returning to action after his shocking first round KO defeat to Ulrik Bokeme at Enfusion Live 46 and looks set to next fight in the forthcoming 84kg Enfusion League in the coming months. Ibrahim El Boustati def. Filip Verlinden via unanimous decision (UD). Luis Tavares def. Mohamed Boubkari by by round 1 KO. Tayfun Ozcan def. Nordin Ben Moh by round 2 KO. Redouan Laarkoubi def. Mohammed Jaraya via extra (4th) round decision. Yassin Baitar def. Jonay Risco via UD. Andre Schmeling def. Hicham Achalhi via extra (4th) round decision. Khadija Charradi def. Essilia Wurms via extra (4th) round decision.